What can I say about this masterpiece. It is one of the best ever recipes that I have created on Becomingness! Hands down! This recipe is a mashup of two of my recipes: my Raw Caramel Slice and my Raw Chocolate Brownies and the result is AMAZING!! I love working with these ingredients! To avoid the chocolate layer cracking, make sure that all the layers are completely frozen before you slice it. Plus, make you sure use a hot knife to slice it when it has completely frozen which will make it easier to slice. I hope you enjoy my latest creation. 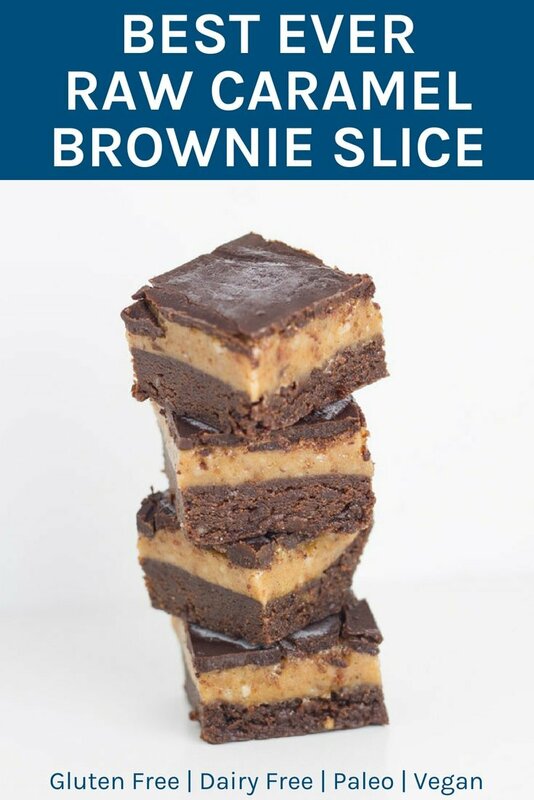 Best Ever Raw Caramel Brownie Slice. 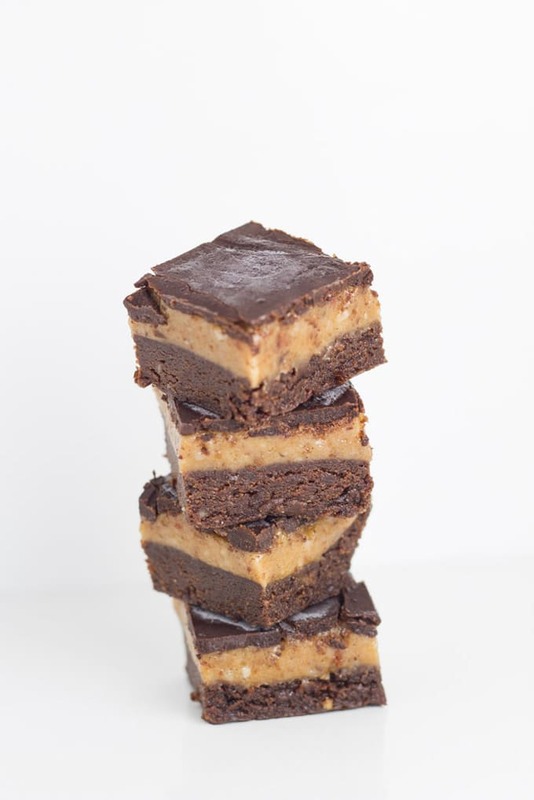 There are three layers to this masterpiece, the chocolate brownie base, a gooey caramel layer and crunchy chocolate layer to top it off. Brownie base: process the walnuts in a food processor until they resemble fine crumbs. Next, add the cacao powder, vanilla and sea salt and process until well combined. Then, add the dates and process until a sticky dough is formed. Spoon mixture into a lined square baking tin and smooth with the back of a spoon. Caramel layer: process the macadamias in a food processor until they resemble fine crumbs, next add the medjool dates, maple syrup and vanilla paste and process until completely combined and smooth. Spoon the mixture on top of the brownie base and smooth with the back of a spoon. Chocolate layer: melt the coconut oil in saucepan on low heat. Once melted, remove from heat and add the maple syrup, whisking briskly until well combined. Then add the cacao powder, stirring until well mixed through. Pour the chocolate on top of the caramel filling and make sure it is evenly spread. Place back into the freezer and let it set completely. You want to ensure that all layers are frozen, so it may take 2-3 hours. You may get some cracks in the chocolate. These should be minimised if you let the slice set in the freezer for 2-3 hours and use a hot knife to slice. 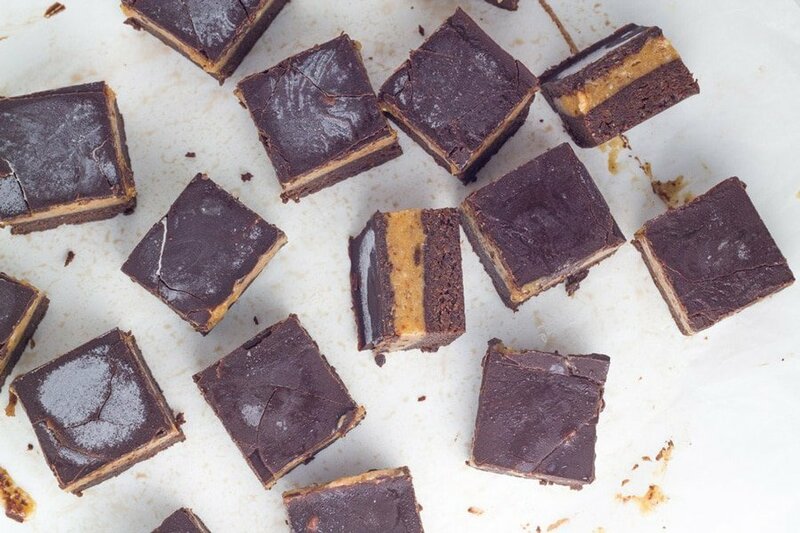 Cook time does not include the time it takes for the raw caramel brownie slice to freeze — approximately 2-3 hours, depending on the temperature of your freezer. I usually don’t have macadamias in the house. Could I use cashews instead?